For too long soils have been the Rodney Dangerfield of natural resources, treated like a second hand resource by environmentalists and conservationists alike. Seems like water, air, and wildlife got all the great press, regulatory protection, love and respect. What about the soil’s ability to provide food? Help create the flavor of a great wine or Juicy peach? To store water and protect against flooding? But it appears times are changing. 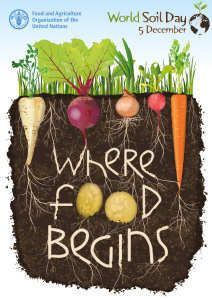 In 2013 the United Nations Food and Agriculture Organization declared the first World Soil Day. The U.N. General Assembly declared 2015 the International Year of Soils (IYS), to raise awareness of the importance of soils for food security and essential ecosystem functions. In addition, the USDA Natural Resources Conservation Service is in the third year of their “Unlock the Secrets of the Soil” campaign to spread the soil heath message around the country. NRCS is also the lead federal agency to classify, map, and provide interpretations about soils to help us make better land use decisions. That’s where I got my training and experience as a soil scientist. At AFT’s National conference in October, National Geographic photographer Jim Richardson explained with amazing photographs the relationship between soil, food production, human culture, and ecosystems. And from a practical matter, we all need to think about feeding 9 billion+ people in 2050, especially in a changing climate. Obviously a higher degree of understanding, protection, and management of our soils will be needed. So on World Soil Day 2014, take a moment to appreciate this critically important natural resource.